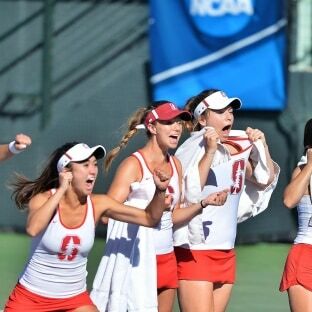 In a match that came down the wire, Stanford managed to hold off a rally from Vanderbilt and win the 2018 DI Women’s Tennis national championship, its ninth since the turn of the century. Stanford’s Melissa Lord’s three-set victory over Vandy’s Fernanda Contreras, including a 7-5 third set, gave the Cardinal the title. After Vanderbilt won the doubles point 2-1 to begin the afternoon, Stanford fought back strong and dominated singles play early. After all six matches had played a set, the Cardinal owned five leads to Vanderbilt’s one. But the Commodores pushed back, forcing a pair of third sets while finishing off the one lead it already held, a two-set Astra Sharma win over Stanford’s Michaela Gordon. Stanford pushed its overall lead to 3-2 on the strength of three two-set wins, but it would all come down to the two matches pushed to third sets: Lord vs. Contreras, and Stanford’s Emily Arbuthnott vs. Vandy’s Amanda Meyer. Meyer made short work of Arbuthnott, winning 6-2 in the third, which pushed the score to 3-3 and the entire focus of the match, the tournament, and the season to the Lord-Contreras matchup. Contreras had once trailed 5-3 in the third set just to even it at 5-5, and worked back from a 40-0 deficit to force a deuce once she got there, but she couldn’t summon up a winner against Melissa Lord. INDIANAPOLIS — The NCAA Division I Women’s Tennis Subcommittee has selected the 64 teams and 16 first- and second-round sites for the 2018 NCAA Division I Women’s Tennis Championship. Per NCAA policy, the top 16 seeds are guaranteed to host if a bid was submitted and criteria are met, and matchups between conference opponents were avoided in the first two rounds of the championship. First- and second-round competition takes place May 11-12 and features four teams playing in a single-elimination format. The winner of each site advances to the Wake Forest Tennis Complex in Winston-Salem, North Carolina, where the 16 teams will compete for the national championship May 17-22. The event will be hosted by Wake Forest University. The matches shall be regulation dual matches. Three doubles matches consisting of six-game sets will be played for one team point, followed by six singles matches, each valued at one team point; played the best of three sets. No-ad scoring will be used and a seven-point tiebreaker (first to seven points, must win by two points) will be played at six-games-all. The team winning four or more team points advances in the championship bracket. During the championships, all matches will be stopped after the doubles point is decided. All remaining individual matches will be stopped once a team winner (four points won) has been determined. The score will only reflect completed matches. The complete list of teams and sites is included on the official bracket, which is available at www.ncaa.com.